This past year has been an interesting one for me. I knew there would be many changes with both kids back at school and I could dedicate my days (and full attention) to my illustration. For those of you who know me, you know how much I love what I do. So 2013 was full of preparation. What do I want to do, now that I am re-entering the world full time? I’ve always been working, staying in the loop, but I wanted to redefine myself as an illustrator. I’ve mentioned all this before in other posts so I won’t get into it too much. I feel like I’ve had a Eureka moment in the past few months. I’ve figured it out. This is what I love doing, and what I want publishers to hire me for! This is how I work, my illustration style what I like spending my days doing. This past 6 months I’ve been trying to use my photographs in my illustration work a little more (Elliott and the Whale). Sometimes it’s textures, sometimes it’s little details here and there. With this most recent illustration the entire background is a photo. I took this photo last winter in Algonquin Provincial Park, one of my favourite places. I had taken a whole bunch of photos in hopes of maybe using them for something like this. Finally I did it! I am so happy with the result. This experiment also helped me work through my Amelie the Storyteller illustration. I was a little stuck on the furry animals in that one, how to render them in colour, but now I know what to do. I plan on finishing that illustration over the Christmas break, since I have other contracts I need to work through right now, but until then I can continue to experiment. 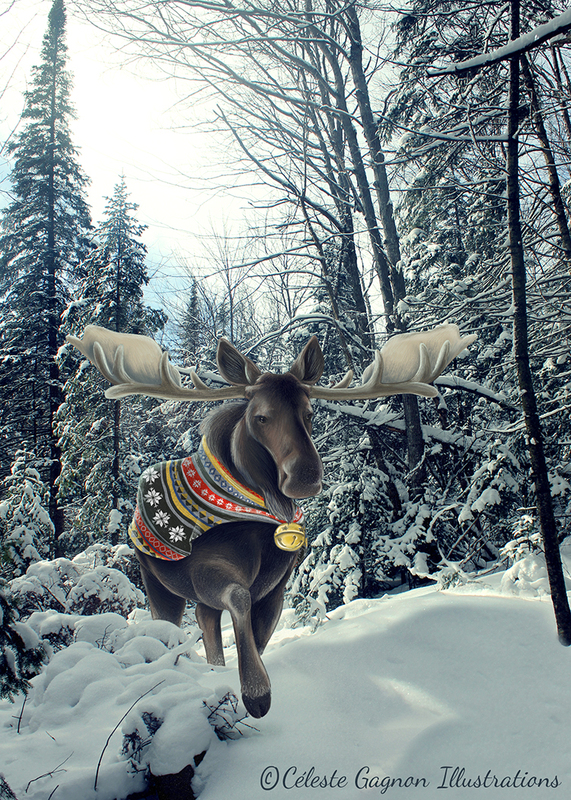 So here it is, my Winter Moose. I will be adding the kids to this illustration for use as my Family Christmas card. But I don’t want to spoil the surprise, so for now this is the illustration. I will show you all the finished card after my family and friends receive their copies in the mail. Once I post the version with the kids I will also show you my process on this one. I was going to do it today, but I want you to see from start to finish, including the roughs and that would spoil the surprise! Next Free printable activities and other cool things!